En klassiker i UFO-kontakt litteraturen (engelska). 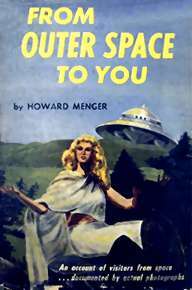 One of the original flying saucer contactees of the 1950s, Howard Menger emerged in 1956 when he told his story to late-night radio talk show host Long John Nebel. Three years later, his book From Outer Space to You appeared. Menger told of contacts that began when he was only ten years old. The original contact was with a beautiful blonde woman whom he met in person but who communicated via telepathy. Other contacts followed with other humanoid beings. Then in 1946, the woman disembarked from a spaceship and announced that a wave of contacts was in humanity's immediate future as many space people were coming to Earth to assist in solving its problems. In 1956, in the wake of the publicity given contactee George Adamski, Menger took some photos of flying saucers, and claimed he took a ride in a Venusian ship. Following his appearance on Nebel's show, he was a guest on a national television shows hosted by Steve Allen and Jack Paar. The television exposure led to attacks by critics. An examination of his pictures led to denouncements that they were a hoax, and they caught Menger lying about his having read (and drawing material from) Adamski's books. Amid the controversy, a young blonde woman came to a gathering at the Menger home. He recognized her as the sister of the space person who had originally contacted him as a child. They began an affair and were eventually married. The woman, Connie Weber, wrote her story, which was published in a book under the pseudonym Karla Baxter. It actually appeared in 1958, a year prior to Menger's first book. The title, My Saturnian Lover, continued Menger's claim that he was actually an extraterrestrial who had reincarnated on Earth. Through the 1960s, Menger seemed to back away from some of his claims, but added assertions of government agents involving him in an elaborate hoax. Through the 1970s and 1980s, the Mengers withdrew from the flying saucer scene, but in the 1990s they returned to reassert their contactee claims. They authored a new book in 1991, and subsequently appeared on a 1992 Discovery Channel one-hour special, "Farewell, Good Brothers," that explored the experiences of several contactees. The Mengers were interviewed before the large saucer model that dominates one room of their Florida home. Häftad/paperback, namn på försättsbladet, i övrigt mycket fint skick. 253 sid., utg. år 1967.